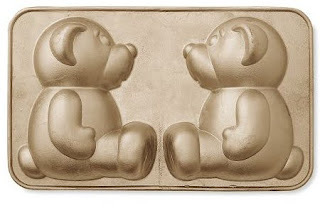 I bought a Build-a-bear cake pan from Williams-Sonoma for Christmas. This was meant as a Christmas present for my wife, however because I do the baking it's really the CAKES that are the present, and thus we tried making one of these cakes over the weekend to give it a trial run before Christmas. Things didn't start off well because the cake pan was defective. The pan's finish wasn't properly applied and had a big crack, and part of it was flaking off. I recommend that anyone planning to buy one of these carefully examine it in the store. The boxes can be opened without destroying them so the store staff shouldn't mind. After exchanging the pan, I followed the recipe on the back of the box. The box comes with a recipe for a bundt cake that is quite easy to make. The cake tasted great, although you can use any recipe you want, as long as the cake is dense enough to stand up on its own. My only complaint is that the recipe is printed on the box, when it should be a paper insert instead. Now I have to transcribe it. I've noticed this defect with every Williams-Sonoma cake pan. I guess it saves on packaging, but please, these pans aren't cheap. At least give us a sheet of paper! Assembling the 3-D bear isn't hard at all. After the cake has finished baking, you cool it for a few minutes in the pan, remove it from the pan, cool it some more, then put it back in the pan. This process takes a few hours in total. When the cake is fully cooled, you put it back in the pan so that you can cut off the extra that rises above the pan. Then you spread icing on half, and put the other half on top, then pop it into the fridge so that the icing can set. We had a slight problem: the cake didn't come cleanly out of the pan the second time, so one half of the bear was decapitated. Luckily we were able to repair it with some icing and skewers; in the end the damage wasn't noticeable. Decorating the finished cake is the hard part. I had a lot of difficulty applying the glaze and the brown sugar which simulates the fur. The Williams-Sonoma website has a how-to video which shows a woman applying the "fur". I notice that her cake doesn't look as good as the one on the box (though it is far better looking than mine). In the end the fur was so difficult that I think my next cake will just use a glaze or icing fur. My "furry" bear appears to have some kind of odd patchy disease. Maybe next time I'll try to make some fondant to clothe the bear; at least then you don't need to put as much fur on. 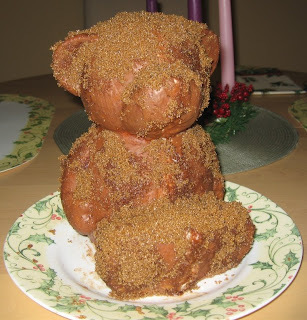 Despite the bear's poor appearance, it was a lot of fun to make and delicious to eat. Hopefully in a couple weeks I'll have perfected my technique. The man from Williams-Sonoma eventually did mail me the Santa Template. Stay tuned; next Christmas I'll try it out. Also, I eventually did make a new bear. It turned out better. Posted by Mr. Shiny and New at 12/16/2008 07:30:00 a.m. I bought this pan and was really excited about baking and decorating the cake, but I have a big problem, the outfits are permanently out of stock and i never was able to purchase them. Do you think i will be able to replicate the fondant outfits on my own? i tried getting the dimentions from Williams Sonoma directly, but they didn't give me what I needed. When I bought the bear the man at the store said he'd give me a photocopy of the template for the santa-suit. He hasn't yet, but you may have better luck from someone at a local store. I'd hurry though. My local store has been baking bears like this to display and to demonstrate the technique, but they probably won't do it now that the holidays are over. The other thing you could do is try making some paper outfits for the finished bear. Just guess at the layout, cut some paper, and fit it. Through some trial and error you should be able to come up with something. Thanks, I will try the local stores. I guess I will also have to sharpen my fondant skills! Try the web site for the Santa outfit -- it's even on sale now! Can anyone send me the recipe that was put on the packaging for this pan? I bought it on clearance post-Christmas and it was the floor display so they no longer had the packaging for it. I know it takes a pretty dense cake to work for this - and I heard that you can't over-stuff the pan or the cake won't come out correct. I always cut the recipe off the box and scan it into my computer that way I never loose them. So Christina - email me at fromontario@hotmail.com so I have your address and I will send it to you - if you still need it. Thanks. I use two boxes of pound cake mix for the cake. During the baking process I scoop some of the batter to the sides, since it all settles in the center so the ears,nose and eyes have some definition. What kind of glaze did you brush on the bear before trying to add the sugar? The workshop video is no longer on the william sonoma website. Thank you for your help! Also, what kind of icing did you use to attach the two sides? Cream the butter then add all the other ingredients and blend until smooth and creamy. The glaze is 1 cup icing sugar, 1 tsp cocoa powder or a few drops of brown food colouring, 2 tbs milk, and 1 cup turbinado or demerara sugar. Whisk the sugar and cocao powder, add the milk slowly and whisk until smooth. Add more cocoa/food colouring until the colour matches the bear's colour. Brush some glaze onto the bear and then sprinkle the sugar on top. Note: this is much harder than it sounds. It will take some practise to get it right. I just bought this pan and won't get it til Friday. I plan to put the bear in a crib for a baby shower this weekend. Can anyone tell me what the dimensions are for the bear so I can start on the crib and at least have that ready to go. Thank you for your help! You can purchase new Fondant decorating kits on ebay. Did anyone ever get this template? I REALLY NEED IT BAD! PLEASE!! I need the templete. Does anyone have it? I work for williams sonoma in canada. I have uncut patterns @ home. I have the soccer player, princess and santa. Anyone interested please feel free to email me and I will email them to you. I accidently threw out the box for this pan before copying the recipe, it used to be on the Williams Sonoma website, but they have now deleted it. Does anybody have the recipe for the cake? I need the cake recipe too, please. Kelley.devlin@gmail.com. thanks so much! !